Brings RSS and Atom feeds to Flarum. /atom/d/21-discussion-slug: feed with the recent posts in the given discussion. You can replace atom by rss in the URLs above to get RSS feeds instead. The tags-related feeds are only available if the tags extension is installed and enabled (obviously). Feeds are linked in the pages for autodiscovery and listing in the browser (at least in Firefox, as Chrome, Vivaldi, and a lot of others doesn't support syndication feeds out of the box). This said, they are not dynamically updated as the page change (except when fully reloaded), becuse of this Firefox bug. If a workaround is found, they will be. The extension is available in English and French. You can submit translations here or on GitHub (there are very few sentences). RSS tokens, so the feeds are not linked to the current session (better to read feeds for private forums on external readers). RSS/Atom feeds for users activity. Private RSS/Atom feed with notifications. The TODOs in the source code. Thanks to @deseven for funding this! This work is published under the CeCILL-B license in French law. Damn, the individual posts discussion-slug perfectly working. And I think only Flarum has this potential ability comparing other forum engine, I ever used since 2000!! For recent replied, it just pointing in to slug-discussion RSS. This is good for user/visitor with slow connection. Or, implementing other 3rd party features such fetching data, since resulting in XML format. 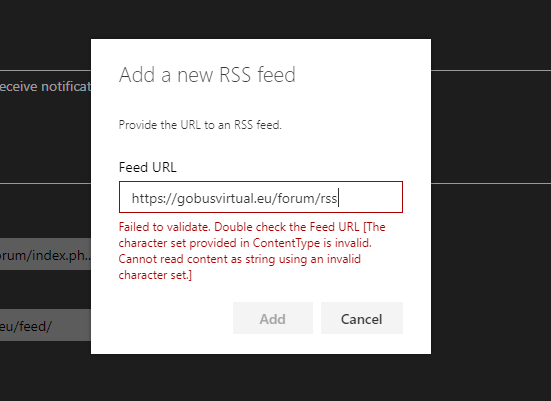 Hopefully, there is admin panel which control the size/limit of fetched RSS characters, attachment, image detection view etc..
kerts93 Are you sure the extension is correctly installed? It returns a 404 (also for /atom); of course the « not found » error page of Flarum is not a valid RSS feed. AmauryPi Ah I disabled it after it wasn't working, that's why you got 404. Can't really see how I can install it wrongly, since it's installed via composer. I can see your RSS feed. That being said, the validation could (and should) be improved. - The GUID (id) are not unique, they match the discussion URL. So RSS readers don't see replies in a same discussion thread as they seem to be updates of existing entries and not full new entries. A solution would be to use a hash from the publication date + author for example. - Only the last reply of a discussion is in the feed. So if two or more replies occur between two feed fetching, only the last one is available. Is it possible to store every replies in the feed, or at least those from the week or the day? Also, I'm wondering if, by any chance, it would be possible to have primary tags somewhere in the entries? - Installation request for amaurycarrade/flarum-ext-syndication 0.1.5 -> satisfiable by amaurycarrade/flarum-ext-syndication[v0.1.5]. - amaurycarrade/flarum-ext-syndication v0.1.5 requires flarum/core 0.1.0-beta.6 -> satisfiable by flarum/core[0.1.x-dev, v0.1.0-beta.6, v0.1.0-beta.7, v0.1.0-beta.7.1] but these conflict with your requirements or minimum-stability. Blodeuwedd make sure you're running composer commands in the Flarum root folder. jtojnar You might want to consider forking this extension and releasing it yourself. @jordanjay29 At the moment, my flarum website is only in maintenance mode so I so not expect to actively develop any of the extensions I updated. I feel that amount of inactive forks of forks of forks is already too high in Flarum community and publishing my forks would only make this issue worse. Having a community GitHub group for important extensions with larger pool of developers would be nice. I imagine something like Friends of Flarum but with open membership policy. That would at least solve the problem of having to replace the extension repository every few months. Unfortunately, since the Flarum community is so small, some extensions might not have a maintainer for a while. The repositories would probably need to carry a disclaimer like “This extension is occasionally maintained, if it seems like it is abandoned and you want to contribute, please request a membership of our group by pinging @OurFlarumGroup/admins in your pull requests.” The group would need to be reasonably big so there were always someone available to add new members and it would be also nice if there were volunteers who could help review the pull requests. Not sure the Flarum community has enough resources for something like this. Friends of flarum doesn't even have a membership policy yet. This means anyone can join. Joining something like that means pushing code. ART994 This extension is not compatible with the latest beta. luceos when will the update be available? or how can i fix it?